Light emitting diodes (LEDs), organic light emitting diodes (OLEDs), and laser diodes are well known solid state electronic devices capable of producing light upon application of a sufficient voltage. Solid-state lighting (SSL) describes a type of lighting which uses LED or OLED as a source of illumination instead of electrical filaments, plasma (e.g., used in arc lamps such as fluorescent lamps) or gas. Light emitting diodes are an electroluminescence device that has a structure in which n-type and p-type semiconductors are joined together, and generate predetermined light in the course of recombination of electrons and holes. LED can be employed in packages for providing white light (e.g., perceived as being white or near-white), and also are developing as substitutes for incandescent, fluorescent, and metal halide high-intensity discharge (HID) light products. LED chips can typically be categorized into three types by structure, i.e., standard LED chip, inverted LED chip and vertical LED chip. LED packaging primarily provides mechanical, electrical, thermal, and optical supports to LED chips. Generally, an LED package consists of a substrate, an LED die fixed on the substrate, and an encapsulation formed on the substrate to shield the LED die. In applications, one or more LED dies (or chips) are mounted inside an LED package or on an LED module, which may make up part of a lighting unit, light bulb, or more simply a "lamp," which may also include constant current drivers to power the LEDs. A SMD (surface mounted device) LED package is one of the LED packages, which electrical connectors come from the underneath of the substrate. This type of package has features in compact design, low cost, high performance, and more flexible in system integration. The chip-on-board (COB) is another type of LED package in which a chip is directly mounted on the circuit pattern of a large package substrate with the chip of a light emitting element. The LED module made in the COB type may cut down the manufacturing cost while improving heat radiation efficiency by shortening a heat transfer path. 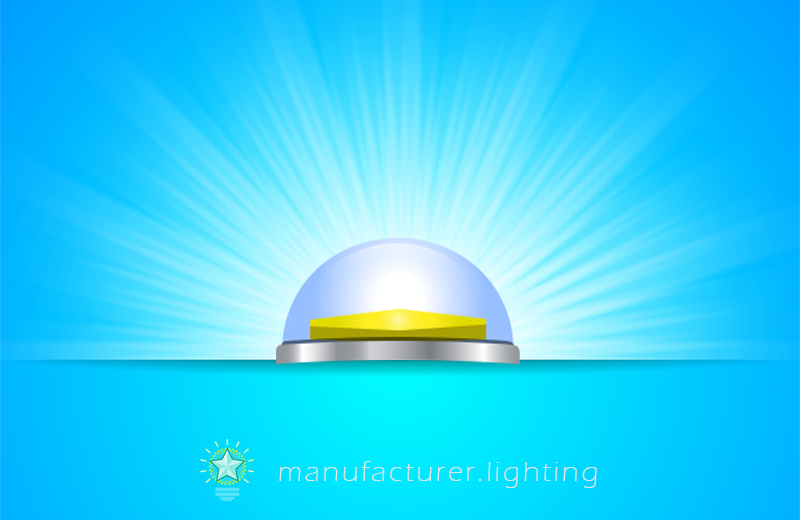 LED filament is another type of COB package made with sapphire, glass, and transparent ceramic substrates. A chip-scale package (CSP) refers to a package for the light emitting device that is attached to the semiconductor light emitting device structure in a wafer-scale process. CSP technology drastically scales down the size of a conventional LED package by combining advanced flip chip technology with phosphor coating technology. An AC LED is an LED that operates directly off of AC line voltage. Most LEDs can run just on direct current (DC) electricity, but internal circuitry in AC LEDs allows powering and controlling them by AC without an AC-to-DC converter. An LED light engine is an LED module with the added driver electronics, whether on board, integrated, or separate, as long as it’s sold as a complete unit. OLEDs take advantage of thin organic films that emit light when voltage is applied across the device. The OLED is configured to emit light when electrons combine with holes within the organic emission layer and drop to a ground state.